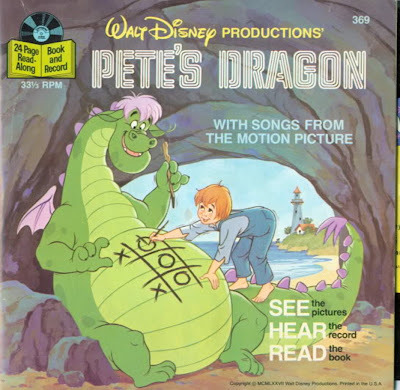 Now here's a flashback from my misspent youth. 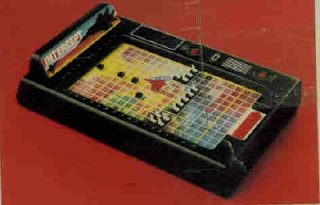 I guess it was the Christmas of 1978 or 1979 when I ripped into a wrapped package to discover this great "electronic" game from a company called Lakeside(Leisure Dynamics, Inc., No. 9005). It was a gift from my folks. Anyway, as the stalwart attack pilot, you are tested in this way (according to the box rear...): "Can you sneak past your opponent's surface-to-air missile sites and attack his Airfield? Manuever secretly across the tracking grid." As the Defense Commander, you are tasked in this fashion: "Can you track down and destroy the Attack Jet? Use your logic to pin-point his position. Fire your rockets to score a direct hit." The coolest piece on the board is a crimson "INTERCEPTOR DEFENSE COMMAND." 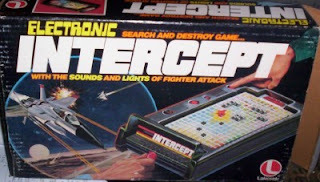 Or as the box describes it: "This Special Aircraft, when placed on Target, ELECTRONICALLY locks on to the Attack Jet. 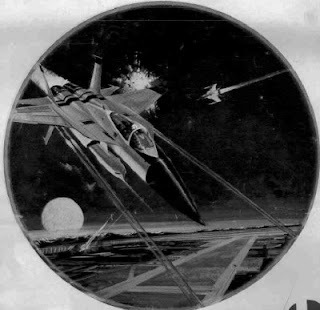 It will program your rocket Fire and score a direct hit as the Attack Jet flares up on the tracking grid." Ah, the days before video games, huh? 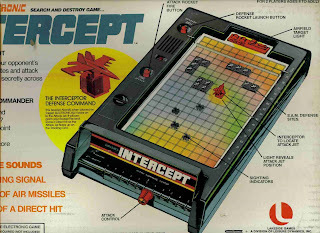 Other pieces in the Intercept "Search and Destroy" Game include, "S.A.M Defense Sites," and "SIGHTING INDICATORS." 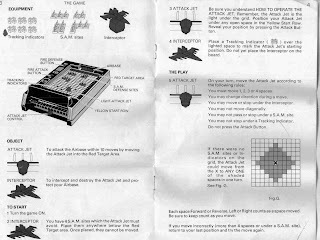 As the Jet fighter, you control your fighter from an ATTACK COMMAND CENTER with a red knob that is the "ATTACK CONTROL." Midway down the board is a red "ATTACK ROCKET FIRE BUTTON." Anyway, it's all very cool, especially from a disco decade kid's point of view, and this is one electronic game that I recall having fun with for hours when I was nine. Back in the year of the original Battlestar Galactica (1978) and the Atari-2600, this baby was absolutely high tech. Did anyone else out there own of these too?